This is a somewhat late 10th anniversary of the Lehman failure post. I am not going to write much that is new, but will restate an argument I have been making for years (following John Quiggin and Miles Kimball). It is trivially easy for the US Treasury (and other treasuries) to make huge profits on the carry trade. These huge profits are, I claim, actual wealth created by the operation. In general, the argument is that, over all recorded long time intervals, returns to a diversified pool of risky assets (such as the market portfolio of stocks) are greater than returns to Treasury bills. The average difference in returns is huge (on the order of 5% per year). This suggests that long term public debt problems could be relieved (or eliminated) if Treasuries issued more low return bonds and purchased a diversified portfolio of risky assets. The common response seems to be that it can’t be so easy and there must be some catch. I claim it is easy to beat the market, so why am I not rich. The response to that is that the huge gains are available to an agent with deep pockets and a long planning horizon — that is states which can borrow at low rates in their own currency. I think the 2008 financial crisis was an accidental experiment proving providing very strong evidence for these claims. The US Federal Government purchases trillions in risky assets at prices higher than private agents were willing to pay. This was done to save the economy and it was assumed that it would cost the Federal Government hundreds of billions. In the event, the Tr easury and the Federal reserve system made the highest profits ever recorded. The reason for the huge forecast error (largest forecast error ever) is that Congress banned consideration of the expected gains from bearing risk. Normally, the CBO scores policies based on the change in the expected value of the federal debt 10 years later. This means that the scores are risk neutral. In the case of the Treasury’s rescue efforts (TARP and the earlier rescue of Fannie Mae and Freddie Mac) they were ordered to mark assets to market — to assume that risky assets had the same value for the deep pocketed infinite horizon Treasury as for private investors (which include wealth managers investing other people’s money who are fired if they have a few quarters of sub-market returns). It was possible to calculate the expected value of corrections to the estimates as uncertainty was resolved. It was in the hundreds of billions of dollars. Almost everyone was surprised by the result that things turned out as (mathematically not subjectively) expected. Barney Frank was the only policy maker who noted this before uncertainty was resolved. He was pilloried for having been soft on Fannie Mae before 2008, and had a strong personal interest in arguing that the bailout would not be a disaster for the Treasury. Also he turned out to be right. Looking at 2017 as a whole, I am very pleased with our progress. We paid $12.0 billion in dividends to Treasury in 2017, bringing our total dividends to taxpayers to $166.4 billion. This compares to the $119.8 billion in draws that we have received or expect to receive shortly. Our pre-tax income was $18.4 billion, very much in line with pretax income of $18.3 billion 2016. 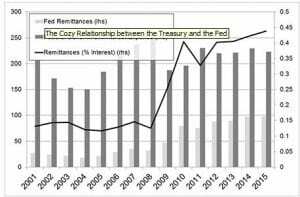 Now the $119.8 billion does not include interest paid on the Treasury securities sold to get the money to loan to Fannie Mae. These interest rates were near zero (Tand could have been even lower if the Treasury issued only Treasury bills and didn’t pay investors to bear term risk). The money sent by Fannie Mae to the Tresury does not sum up the gains to the Treasury which currently owns preferred shares, 80% of the common stock (if it were higher they would have to consolidate accounts and violated the debt ceiling) and the rights (just take but with the approval of judges) to all future dividends. The huge profits were a side product of the effort. The main point of the rescue is that it was necessary to prevent a total collapse of the housing industry. In the crisis years, Fannie Mae and Freddie Mac were bearing the vast bulk (80% IIRC) of default risk on newly issued mortgages. This is true. No one is forced to do business with them. Mortgage initiators do because unloading risk on Fannie and Freddie makes it possible for them too to get high profits. But the cost of this subsidy was negative 12 billion last year. So why is it a problem ? 2) Fannie and Freddie are sucking money out of the economy. Their profits are like a tax. Not so true. Their profits are the result of private sector agents choosing to trade with them. 3) If there is another great recession, they will have huge losses automatically implying a larger budget deficit exactly when the economy is depressed. True. They also serve as an automatic stabilizer. This is a good thing. It is better for the Treasury to lose money during recessions than for private agents to lose the money. Since the Treasury belongs to citizens, rational people would cut spending if it lost money (this is called Ricardian equivalence). But you make policy for the people you have not the people Fresh water economists want. In the real world Treasuries hide profits and losses from people who don’t act as fully rational agents (this is what Ricardo actually wrote). 4) It can’t be that easy. Why doesn’t everyone do that ? This was supposed to be a brief post. After the jump, I discuss TARP and the really big bailout — QE 1. Before I want to complain. My assertion is that partial public ownership of the means of production would benefit the country. Yet I often find myself criticized by leftists who think I am soft on bankers. I don’t understand this. It is certainly true that the 2008-9 bailouts were good for bankers. That doesn’t mean they were bad for the rest of us. It also doesn’t mean that similar operations now that the financial system isn’t in crisis would be good for bankers. The other complaint is that, since the Treasury can borrow at low interest rates, publicly owned financial services agencies (such as Fannie and Freddie) have an unfair advantage. They can easily drive private firms out of currently profitable markets because the immense debt capacity of the US Treasury makes risk bearing and maturity transformation cheap. This is unfair to the poor bankers who can make huge incomes doing something that modestly paid bureaucrats can do better. Cry me a river. Freddie Mac is huge compared to all financial firms except Fannie Mae. It too is profitable (and the profits belong to the US Treasury). TARP was about as fun as a root canal (in a rare dissent Ezra Klein said Obama was wrong about this — he had recently had a root canal which was much more fun than TARP). TARP was also profitable. In particular, the Treasury made money rescuing the banks. It lost money saving GM, Chrystler, AIG and bailing out too few mortgagers with the HAMP flop. Overall TARP other than HAMP was profitable. Some (including Joe Stiglitz) complain that the Treasury bailed out banks not homeowners with underwater mortgages. In fact, the Treasury made money dealing with the banks and spent it bailing out (too few) homeowners. Aside from HAMP (money given not lent with no expectation of any return) TARP was also used to save the US auto industry. The Federal Reserve System. In QE 1, Federal Reserve banks spent a trillion dollars buying risky mortgage backed securities which no one else wanted. I almost typed “bought about $ 1 Trillion worth of RMBS” but that would be a very odd use of “worth” since no other entity was willing to pay that price for the assets. I think it is safe to say that QE 1 consisted of a purchase at market prices plus a huge gift. It was also hugely profitable. QE3 also involved buying risky assets with a huge net return since they paid more than 0.25% per year ex post including writoffs for the defaults (which mostly didn’t occur). Notice that these largest ever measured profits were earned as a result of an effort to save the financial system. They were an accident. This proves suggests that trillions of dollars worth of value are just sitting there and that prejudice against socialism (and the interests of bankers who don’t want to lose the competition) are keeping us from picking them up. Thank you for this. If nothing else it helps explain my chosen commenting handle: I describe myself as an Amateur Socialist mostly because the pros haven’t managed to do much with the idea, as far as I can tell. And now that you’ve established the unique abilities of the Federal Reserve to profit from risky assets, how do we keep the ball rolling? Lots of boomers nearing retirement age; some have managed to accumulate sizable 401K balances despite downturns/crashes recessions. And then what? The traditional annuity products appear to have the undesirable properties of being both expensive and risky; Who would want to risk a (remaining) lifetime of income on whether or not a given bank/insurance company wouldn’t end up in liquidation? Especially given the pitiful “safe” rate of returns? If the post office banking system resumed operation it could both revitalize the USPS and offer investors a safe way to invest retirement balances that can’t receive FDIC insurance ( one of the things 401Ks are statutorily prohibited from investing in is FDIC insured accounts, interestingly enough). And once the government started making money assuming risk from retirement portfolios there are probably other good places to invest. Publicly owned telecom/broadband services, transit infrastructure, renewable energy etc. Makes me wonder what Senator(s) Warren, Sanders, et al. think of this. Fear of having the govment control large chunks of money is not new. In the 40s Congress cut back the planned taxes going to the Social Security trust fund because the amount of money FDR would have wanted invested for each beneficiary came to a scary huge number. Sorry, but that isn’t socialism, that is market subsidy. Agriculture has the same kind of structure. Your getting confused and it shows. The Pecora report, which was behind the Glass-Steagall reforms, treated corporate ownership like this. The idea was that if the government imposed a 50% tax rate on a corporation then it effectively collected dividends as if it owned half the corporation. They admitted that this wasn’t quite true, but it provided a way of thinking about the place of corporations and their relationship to the government. As we have seen, corporations figured out how to squeeze out their government owner / partner, so more recently governments are experimenting with actual equity positions. It will be interesting to watch, especially once someone in the government discovers that corporations are just government chartered entities. @bert schlitz it is an odd kind of subsidy if the Treasury ends up trillions ahead. Also the owner is the residual claimant, so the proposal is partial public ownership. Finally, you are rude. @Arne I actually have some sympathy for that fear. In my proposal the Federal Government owns and bears risk, but doesn’t vote the shares. I agree that would be too much power for anyone. @Kaleberg. Indeed. There is a difference between taxing half of corporate net income and demanding half of the dividends. Reported profits are much higher than taxable earnings even though they are theoretically the same thing. Also taking half the dividends implies expensing investment (not taxing reinvested earnings) which is good policy. The point, as you note, is that there is a real benefit to a policy that whatever a firm does for shareholders it also does for the Treasury. It is much harder to dodge. Not a surprise with Bert.